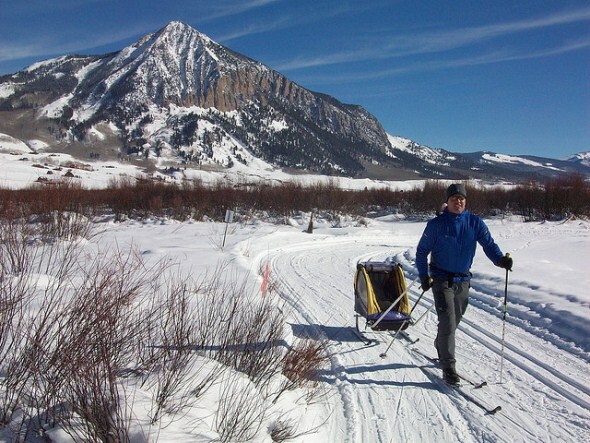 The Crested Butte Nordic Center offers 31 miles of groomed cross-country ski trails that take skiers or snowshoers around the town of Crested Butte. Trails run along the East and Slate rivers, through forests around Peanut Lake, and up the Mount Crested Butte Recreation Path. There are trails from novice to advanced, and the trails are groomed for both classic and skate skiing. The center has the Magic Meadows Yurt nestled among the pines on the Lake Loop Trail that is open for special occasions and is available for rental by groups. The center also offers a ski school, backcountry ski tours, and moonlight ski parties.